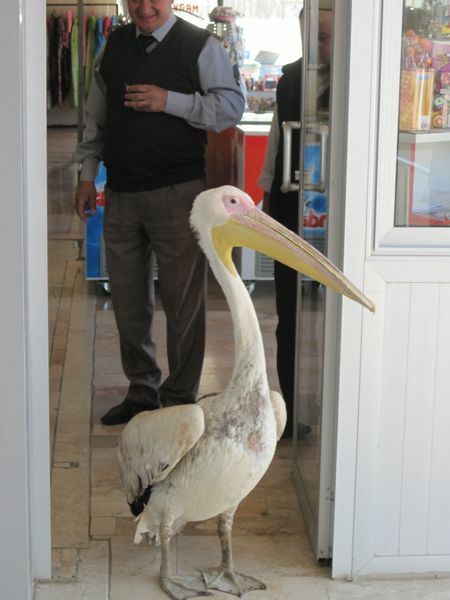 Yet another week of adventures with friends in Turkey—oh, lucky me! Lucky us. We began week two in Antalya, one of my favorite cities. 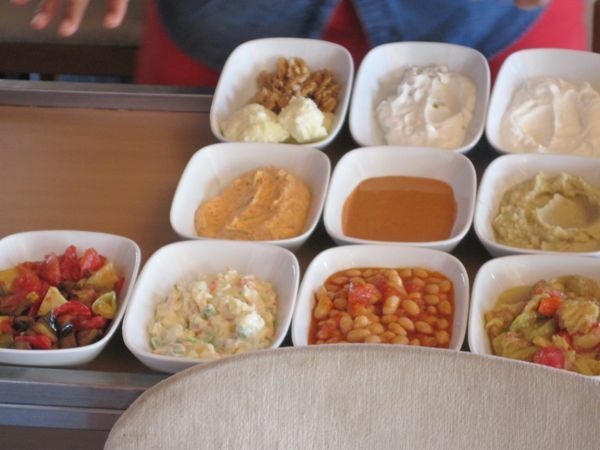 We arrived around noon at 7 Mehmet, a modern open-fronted restaurant overlooking the Mediterranean. Our guide Mehmet deemed it one of his favorite restaurants, and it was spectacular. 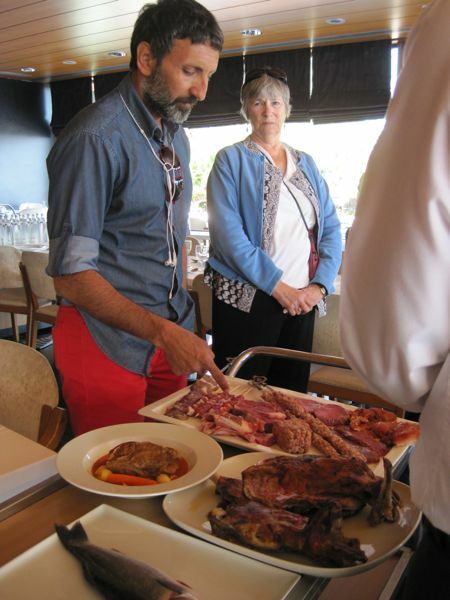 The manager emerged with a tray of a dozen mezes (hors d’oeuvres) to choose from, then a massive tray of uncooked meats, ranging from spicy lamb kebobs to steaks to lamb shanks to chicken and fresh fish. Within minutes we had drinks, mezes and bread before us, and soon an array of luscious main courses arrived. Oh, my. After desserts, tea, and coffee, we headed for the Antalya Museum, which holds treasures from the area’s many ruins, artfully displayed with thorough explanations in both Turkish and English. Since many of Turkey’s greatest treasures reside in Berlin and London, they’re quite proud to have finally acquired the top half of an important statue of Hercules. Mehmet explained that in 1980 it was discovered in two pieces in the ruins of ancient Perge, and its discoverers reburied it to gather equipment and retrieve it the next day. The returned to find that the top half of the statue had been stolen. It finally materialized in Boston, and lengthy negotiations finally brought it back to its home in Turkey. A life-sized statue, it’s a significant archeological find. 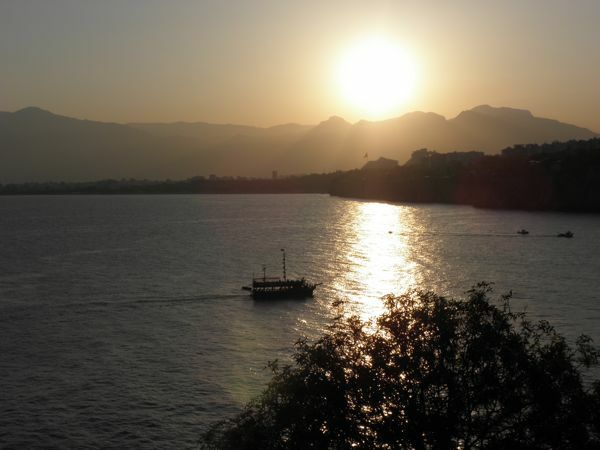 We spent two glorious days exploring Antalya, deciding to forego another tour of ruins for a boat ride on the Mediterranean. Mehmet chartered a wooden sailboat, the highlight of the trip for many. 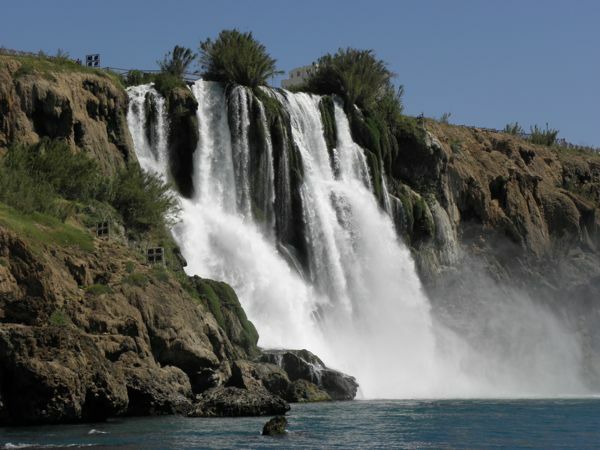 We skimmed along the rocky coastline until we reached Düden Falls, where we anchored. Some of us dove into the sea, as warm as Minnesota’s inland lakes in July, though far saltier. It was fabulous. My 84-year-old friend Thelma swam with us, increasing the respect that everyone had already developed for her. Thelma’s my role model, enjoying every experience that comes her way. She didn’t balk at a thing on this trip—talk about living life to the fullest! 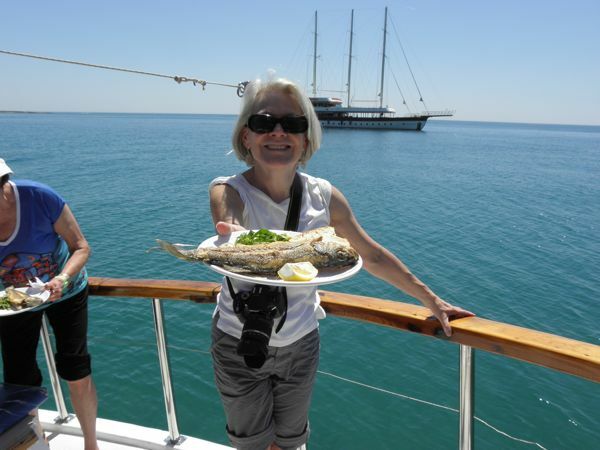 Once we’d dried off and sipped a brew or two, we were treated to a lunch of fresh grilled fish, salad, and pasta. YUM!!! After an afternoon wandering the old city, my young friend Aşkin joined us for dinner. We’ve been friends since 2005, and he calls me “My Sweetie Teacher.” Aşkin has moved to Antalya to help engineer a 30-million-dollar yacht with a heliport on the deck. Man, oh man. Some people live mighty high, I guess. Turkey is proud to be producing yachts on the level of Hamburg, Germany. Its economy is healthy and growing, partly because it’s a progressive and innovative country and partly because it’s a young country. 60% of its population is under 45. On our way up to Cappadocia we stopped at Konya, where we toured the Selimiye Mosque and the Mevlana Museum, the center of Sufi mysticism founded by the famous poet, Rumi. 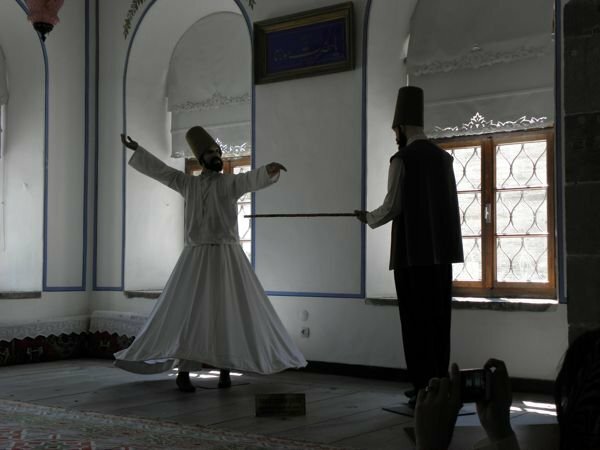 We’re most familiar with the whirling dervishes of this movement, which was totally fascinating. 3. In concealing others’ faults, be like the night. 4. In angry and fury, be like the dead. How could anyone dispute this wisdom from Rumi, the 13th century poet sage? 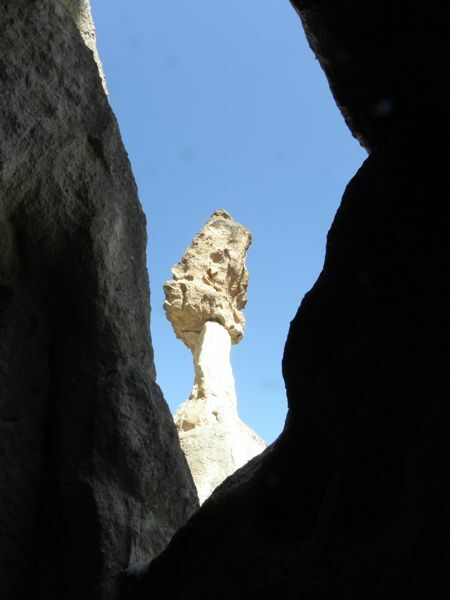 Our next destination was Cappadocia, the land of bizarre rock formations and cave homes. 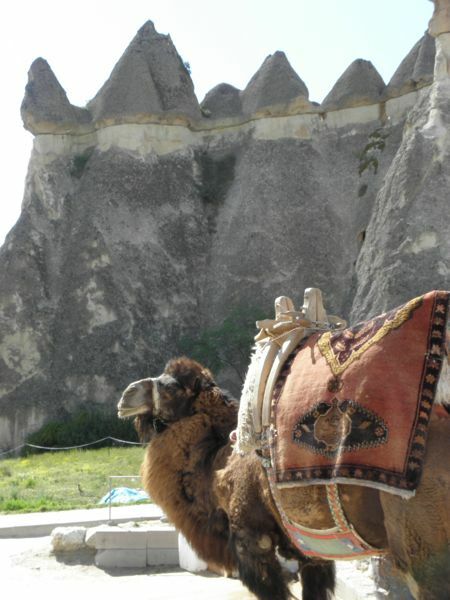 It broke my heart to stay in a bland, massive hotel rather than the charming Kelebek in Göreme, but that’s one of the trade-offs for traveling in a large group. Though the Dinler Hotel was disappointing, their food was the best of all the hotels we stayed in. Sadly, though, we were all so stuffed from ten days on the road that we could hardly take full advantage. 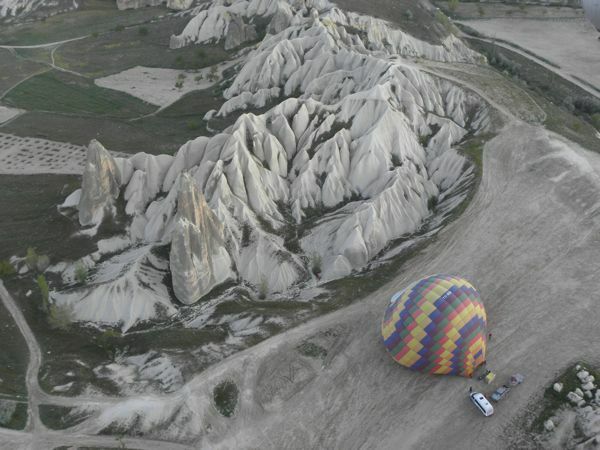 Eleven of us opted for the expensive but mind-boggling balloon ride over the area. 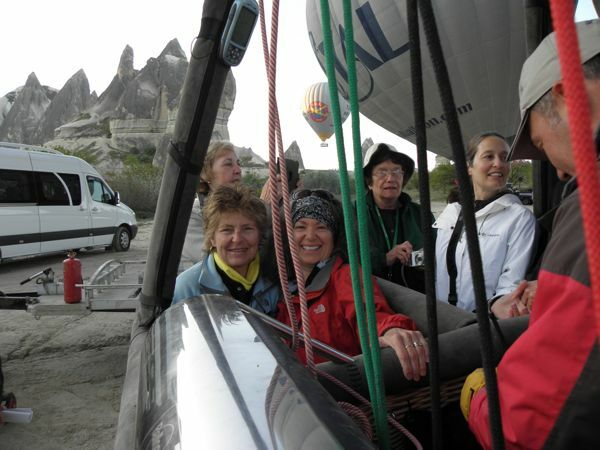 We paid $220 each for the experience of a lifetime, sharing a wicker basket with friends as our driver navigated our balloon over the ripples and fairy chimneys of Göreme, the Pigeon Valley, and the Rose Valley. It was beyond stunning. Our pilot communicated by walkie-talkie with his ground crew, who followed along beneath us to position for our landing. Unfortunately, they got the trailer stuck on a steep roadside incline and had to unhook their truck and tow it out from the other side. We hovered happily until they extricated themselves and tore off to another field, where we landed directly on the trailer. A few of us were carried from the basket to the ground, and Lynette, our youngest, was carried across the field to a card table table, where we were treated to champagne and presented with heavy gold medals, proof of our unforgettable experience. 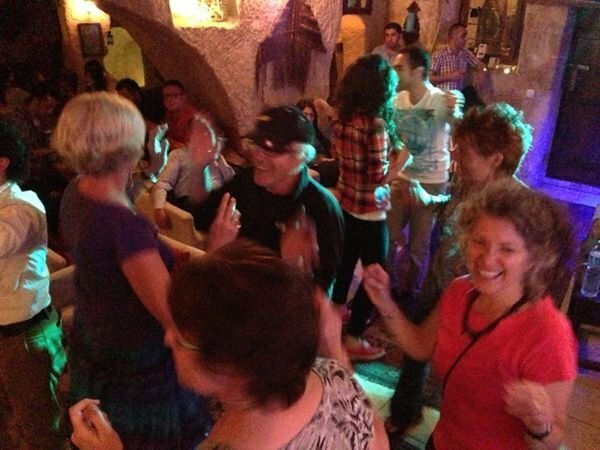 That night my friend Ali (a Göreme carpet dealer) brought five of us to a cave night club for live music and dancing. It was an absolute blast; the Turks welcomed us warmly with smiles and encouragement as we danced, and they went nuts over Jerry, who dances with enthused abandon. The only foreigners there, we joined hands with the Turks for the halay, a traditional Turkish dance. I don’t think I’ve ever enjoyed a night out so much. And Susie got her dancing fix, an absolute necessity at home and away. 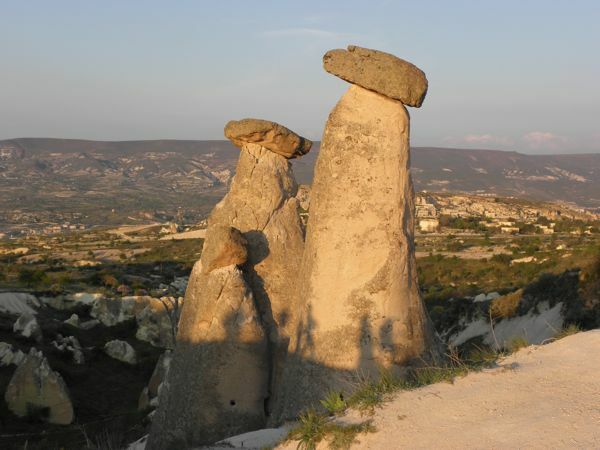 The next day we visited an underground city and a number of extraordinary rock formations, then hopped on a plane for Istanbul, completing our circle tour of Turkey. We finished with a Bosphorus cruise, a lovely fish lunch in the quaint waterside community of Beylerbeyi, and a visit to the Grand Bazaar. 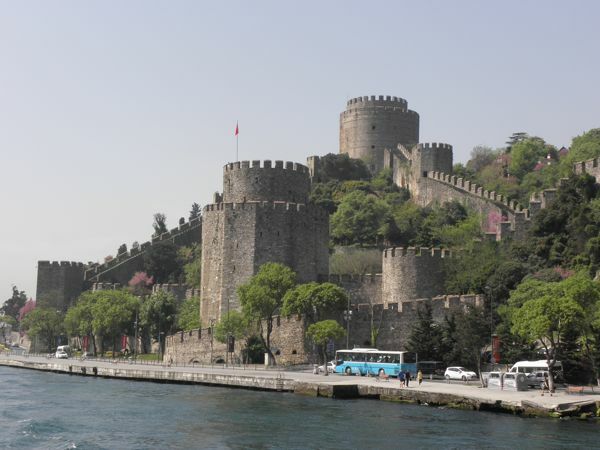 The Bosphorus’ Rumile Castle was built in 1453 by the Ottomans to conquer Constantinople. We celebrated with a final meal at the Taş Han’s Arkat Night Club, located in its underground cistern. 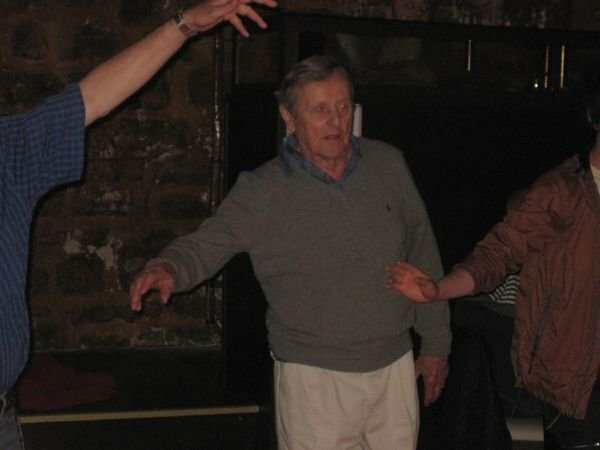 The highlight of their floor show was a belly dancing lesson for two of our members, Muriel Thompson and Bob Hertzberger. It just doesn’t get better. 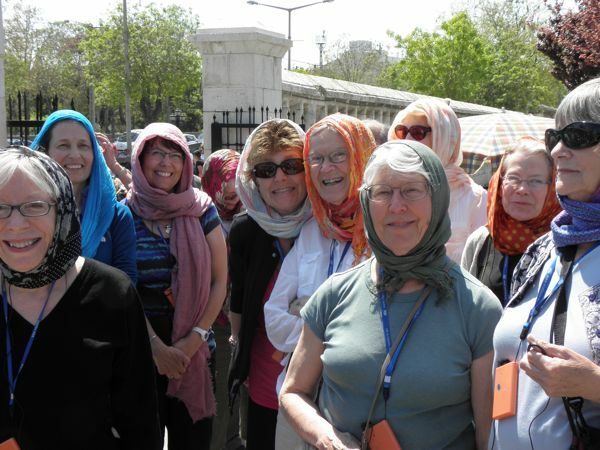 I never dreamed that a group of 20 friends could make for such an interesting tour. We all enjoyed it, and even our tour guide felt the camaraderie of this bright, interested, and positive group. As I said earlier, lucky us! Half of us are extending our trip to enjoy Istanbul. And enjoy it we will. Previous postBack in Turkey—yet again! Ann Marie, The photos really capture what a good time everyone had. Don’t forget, drive a hard bargain on the wine! We’re sure everyone went home with great memories of the trip. My one regret about our trip was I did not get up and dance. Oh, to be so free. Thanks for this wonderful post. You are incredible. I hope all is well with you. I am glad you passed up Paris, Vienna, Geneva, etc. and made Istanbul your home. The kids at Koc are lucky to have a teacher like you. Your blog is a reflection of you and your personality. I am also impressed with your use of technology. You are a great role model for other teachers:) FYI: that includes me…I can’t wait to read about your future adventures in Istanbul.